This book doesn't appear on bestseller lists, but I'm sure it sold quite well, as it was the novelization of a very popular film, the original Thief of Bagdad, a silent film made by Douglas Fairbanks in 1924. The Fairbanks movie is considered his masterpiece, and one of the great silent films of all time. The 1940 talkie remake, produced by Alexander Korda, is regarded with similar respect. Both films were truly groundbreaking for their special effects. This was relatively early in the history of movie novelizations (the first I can find were about a decade earlier). My edition is from A. L. Burt, by arrangement with H. K. Fly, which was a firm noted for play scenarios and novelizations of plays, and thus presumably a natural source for movie novelizations. It is illustrated with a few stills from the film. 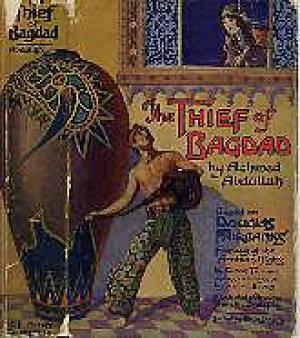 The byline is given "By Achmed Abdullah, writer of many lands and many peoples", and then credited further as follows: "Based on Douglas Fairbanks' Fantasy of the Arabian Nights, by Elton Thomas (copyright 1924 by Douglas Fairbanks) and a short version by Lotta Woods (also copyright by Fairbanks)". As far as I can tell, Elton Thomas is a pseudonym for Fairbanks, though Lotta Woods may be another person. The conception, apparently, was all due to Fairbanks, based on several stories from the Thousand Nights and a Night. Achmed Abdullah (1881-1945) was an interesting person. He emigrated to the US sometime in the teens, and became a writer, of short fiction (especially for pulps such as Argosy and Blue Book), of plays, and of screenplays. He was once nominated for an Academy Award, for his screenplay for The Lives of a Bengal Lancer. His biography before he reached the US is less well-attested. He claimed to have been born in Russia to an Orthodox family (supposedly a relative of the Czar, but there is no record of a Romanoff cousin matching the details he gives), but to have been raised by his uncle, a Muslim. He said he moved to England and attended Eton and Oxford (neither school has any record of his attendance), and later joined the British Army, reaching the rank of Colonel. In the US, he married three times, and the book at hand is dedicated to his second wife, Jean Wick. The story opens in Bagdad, with Ahmed, the eponymous Thief of Bagdad, engaging in a couple of thefts, eventually finding himself on the run, which leads him to the house of the Caliph. And there he gets a glimpse of the Caliph's beautiful daughter, Zobeid, and of course he falls immediatly in love with her. His mentor, the Bird of Evil, hatches a plan to get access to her -- and as it happens on that very day three foreign princes are coming to woo her: the Prince of Persia, the Prince of India, and the Prince of the Mongols. Ahmed poses as the Prince of the Isles, and one thing after another, the Princess falls in love with him as well. (Likely the various faults of the other suitors contribute!) But Ahmed abandons his plan to drug her, and determines to earn her love honestly, and confesses to being a thief. He is taken, and sentenced to death -- but Zobeid arranges his escape. Then, faced with the impossible choice between the corpulent Prince of Persia, the overproud Prince of India, and the treacherous and warlike Prince of the Mongols, she arranges a contest -- whoever can bring her the rarest treasure after seven months shall gain her hand. So all the Princes head off to find a rare treasure. And Ahmed goes on that search as well. Key for him is his decision to commit himself to Islam, while before he had been a scoffer and a skeptic. So his journey takes him to the Valley of Seven Temptations, the Hill of Eternal Fire, and through other ordeals, until he finally reaches the Sea of Resignation to Fate, wherein he is guided to find a cloak of invisibility and a special silver box. Meanwhile the other Princes find certain rarities as well -- the Persian finds a flying carpet, the Indian finds an eye that can see anywhere, and the Mongol finds an apple that can restore life to anyone from any illness. Well, you probably know how it ends. Really, despite some silliness and extreme overwriting, this was a reasonably entertaining novel. Better still, I am sure, are both movies! My son Geoff reports that he's seen the Fairbanks movie, and recalls it as pretty good. And the Korda movie looks good as well. So I figure I'll try them both soon enough. I'm startled you haven't seen either. The silent is excellent, though I'm always amused to think that if you're casting a film set in what becomes Iraq, of course the leads should be Douglas Fairbanks and Anna May Wong (both impressive, nonetheless). The Korda remake is even better, even if small bits and pieces of it are a bit stiff. I suspect that a novelization would've been kept off bestseller lists, particularly if not published by a heavily advertising publisher. The corruption of "bestseller" lists didn't begin with the NYT in the 1950s, after all. I did wonder whether novelizations were considered ineligible for bestseller lists at the time.